Leaked 'GH' script shows Mrs. Corinthos locked up after Nelle’s gaslight plan succeeds. 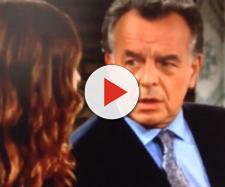 Carly to get locked up in "GH?" "General Hospital" spoilers from the latest promo show that the battle between Carly Corinthos (Laura Wright) and Nelle Benson (Emmy-winner Chloe Lanier) reached new heights at the baby shower. Nelle set Carly up by having Ava Jerome (Maura West) gift her with something she knew would set off Carly. Sure enough, Carly raged crazily in front of everyone and cliffhanger Friday leads to Carly's arrest! The latest "GH" spoilers from this week's soap magazines show that by Tuesday, May 15, Carly is in handcuffs and headed to jail and then the mental hospital. If you forgot, back in 2000 when Sarah Brown was playing Carly, she was pregnant with Sonny Corinthos' (Maurice Benard) baby and argued at the top of the stairs at the Q mansion with AJ Quartermaine (Billy Warlock). Carly miscarried the baby. And now, spoilers say that history repeats itself on Friday and Monday. On Thursday's "GH" we saw Nelle open the gift from Ava that Nelle set up for the occasion. It was a mobile of penguins which Nelle knew would trigger Carly. Morgan Corinthos (Bryan Craig) loved penguins, so Carly reacted like it was a slap in the face, cursed at Ava, and had a wild tantrum. It made Carly look nutty and aggressive. "General Hospital" spoilers say that Carly and Nelle bicker on the stairs after Carly's outburst. Nelle has everyone at the shower, plus Michael Corinthos (Chad Duell), thinking about something terrible happening to Nelle. Giving a fresh copy of the guardianship papers to Carly has everyone well aware that if Nelle is harmed, Carly will get her child. Then, moments later, Carly snaps. So when Nelle falls on Friday's "GH" cliffhanger, it won't matter if Carly pushed her or Nelle staged the fall. It looks bad for Carly. When everyone at the shower sees that Nelle fell, all eyes turn to Carly. Next week, Dante Falconeri (Dominic Zamprgona) has no choice but to arrest his step-mother. Already, Michael and Sonny were discussing Carly’s erratic behavior and aggression toward Nelle. "General Hospital" spoilers from a script that leaked on Twitter showed that Carly is locked up at a mental hospital. New spoilers from this week's Soap Opera Digest explain how she gets there. Nelle is taken to the hospital, and all signs point to her going into labor. Nelle will survive, but she will have some medical distress. The crisis could be real or fake, and with Nelle, you never know. Everyone turns on Carly, even her husband, daughter, and son. Nelle pulls through, gets her baby, and her plan works. The week of May 21, Diane Miller (Carolyn Hennesy) is worried that Carly is sabotaging her case and it looks like pleading insanity and sending her to a mental facility is the only way to keep her out of Pentonville. But it could also be a huge turning point for Carly. Who does Carly find at the mental hospital? One thing is for sure -- Bryan Craig isn't coming back to "GH." His CW show "Valor" just got canceled but now he's on Eva Longoria's Miami-based primetime soap "Grand Hotel." But rumors of a recast of Morgan have been swirling for months. A mental hospital is a perfect place for Carly to find her son. His body was never found, so that sets the stage for him to turn up at any time. "General Hospital" spoilers and rumors tease that Carly must get something out of this awful storyline. It won’t be enough just to exonerate her or expose Nelle as a villain – Carly needs to be rewarded for surviving this. On Wednesday's "GH" Sonny said that Carly wasn't in her "right mind." But Sonny and Michael also talked about the miracle of Jason Morgan (Steve Burton) coming back from the dead and how it would be great if it happened with Morgan too. "GH" on Wednesday had Sonny saying maybe it's "wishful thinking" on Carly's part, but this may have been a huge "GH" spoiler that Morgan is coming back soon. Morgan would have been injured in the explosion and could be an amnesiac tucked away in the mental hospital where Carly is sent. The leaked script shows that Carly doesn't go to one of the known mental facilities -- Shadybrook, the Freedman Clinic, or Miscavige. After all, if Morgan was at one of the asylums we've seen, he might be recognized by staff. Could it be time for Morgan to return in a May sweeps shocker? Check back for more "General Hospital" spoilers.